In today’s ultra-challenging job market, there are many opportunities out there for so-called “contract” or “consulting” jobs. Historically in the staffing business, it’s a well known pattern that when the economy is down, companies tend to rely more on contract resources to get work done rather than hiring permanent employees. When the economy is up, the reverse is true and permanent jobs tend to outweigh contract opportunities. It’s a very cyclical and predictable shift in how companies approach hiring. I think it’s safe to say that most job-seekers — especially those who recently lost their permanent positions as a result of the economic downturn over the last few years — are hoping to find another full-time, permanent job. They might be reluctant to accept a contract position for fear of being unavailable if a permanent position suddenly presents itself elsewhere. On the other hand, working is better than not working, right? And very often a person will start out as a contract employee and end up being hired by that same company on a permanent basis because they performed so well. Still other job-seekers actually prefer the world of contracting, and only pursue those sorts of temporary positions. Such professional contract/consultants usually have a very specialized skill-set that is in high demand, and can actually make more money contracting than they could as a permanent employee. Those contract/consultants also often move around a lot, accepting contract positions in different locations for varying lengths of time. In other cases, there are many senior-level semi-retired professionals who no longer wish to return to the grind of a permanent position, but are still interested in remaining active in their field by taking on interim contract assignments. Consulting Job: A fancier name for a contract job. Could be a higher, more senior-level position. Permanent Job: The traditional employee situation with a company. Usually (but not always) includes benefits. 1099 vs. W-2: A “1099” employee is a self-employed “independent contractor.” Independent contractors bill their clients for their time – usually by using a purchase order – based either on an hourly rate or a flat fee for services rendered. Either way, no deductions are withheld from their payments, and they are responsible for paying all their own taxes (using IRS Form 1099 … hence the name.) On the other hand, a W-2 employee gets paychecks from the company they are employed by, based on the hours they work, at an agreed upon hourly rate. Those paychecks will already have all the standard deductions taken out for them by their employer (federal, state and local taxes, social security, medicare, etc.) Also, 1099 contractors must pay self-employment tax, while W-2 employees do not. In addition, independent contractors are often required by their clients to carry their own liability and other types of insurance. At-Will Employee: In the United States¹, most “permanent employees” in today’s work world are hired “at will” – a legal term which means that they can quit anytime for any reason (or no reason at all) without giving advanced notice. Of course, the reverse is also true: they can be fired at any time for any reason (or no reason at all) without advanced notice. This really blows the old concept of “job security” eh?! It also tends to blur the line between a contract and so-called “permanent” job. When presented with the prospect of a contract job, it’s fairly easy for job-seekers to evaluate the overall pros and cons of such a position. Of course, each situation is different — but the following things are mostly true for all contract jobs. 1) Income. Money coming in is always good, right? Bills get paid! 2) It looks good on a résumé. Contract jobs – even short-term ones – look way better on a résumé than a gap in employment … especially if it’s work within your industry niche. 3) It keeps you current and up-to-date in your field. 4) A contract job gets your foot in the door of a company that could potentially hire you on a permanent basis. 1) By definition, it’s a temporary position. When the contract ends (and they almost always do at some point) you will most likely be unemployed again. Future unemployment benefits could possibly be affected. 2) Generally, contract jobs do not include benefits (health insurance, retirement plans, etc.) unless they are available through a 3rd party staffing firm. 3) Contract employees often feel like outsiders at their companies. They don’t have the same feeling of “ownership” of their work that permanent employees usually have, nor do they enjoy the same feeling of camaraderie with their co-workers that permanent employees usually feel. Whether a contractor is a 1099 or a W-2, working directly for a client or through a staffing firm, full-time or part-time … contract assignments generally fall into 3 categories or “flavors.” This is something that often confuses job-seekers (and recruiters!) when they hear about a contracting opportunity. I’ve even heard from some job-seekers that the recruiters they spoke with don’t seem entirely sure which flavor of contract opportunity they are working on. Clarifying which of these 3 flavors someone is looking at is critical in evaluating such an opportunity, and deciding if it’s worth pursing. This is when the contract has a pre-defined beginning and end date. The duration could be any length … from a few days to a few weeks or months. I’ve even seen contracts last up to a year or more. The main thing that defines this type of contract is that there is no plan whatsoever to bring the person on board as a permanent employee. It’s either not in the company’s budget, or for whatever reason the company does not want to add headcount to their permanent payroll. When the contract ends, the job is over. In this scenario, the company already has an approved “req” (requisition) from their HR department to hire a new permanent employee. However, they want to start the person out as a contractor first – mostly to see how they perform and how they fit in with the company and the personnel. It’s the classic “Try-Buy” situation. They don’t want to pull the trigger and hire someone until they are absolutely sure they have the right person for the job. If it doesn’t work out, it’s a lot less complicated for the company to simply end the contract than it would be to terminate a permanent employee. Here, the person starts out as a limited duration contractor, just like number 1. However, in this case, the company has made it known that they are at least open to the possibility of converting the contractor into a permanent employee. The rub is that they do not actually have an approved “req” (requisition) from their HR department allowing them to hire a new person. This can be the most frustrating situation of all. This scenario suggests that if the person does a great job and proves to be a valuable asset to the company, their boss could then request permission to hire the person. But, there is certainly no guarantee that such a request would be approved … and no actual promise of permanent employment no matter how well the person performs. The decision of whether or not to hire the contractor is often dependent on factors totally out of that person’s control. Those last two flavors are often confused with each other, and many times are both referred to by recruiters as “Contract-to-Hire” or “Temp-to-Perm” opportunities. However, as I’ve just explained, they are quite different from each other in a very fundamental way. It’s up to each job-seeker to dig in and ask the right questions when evaluating these opportunities. The most obvious question should be: “Does the company already have an approved req to go ahead and hire someone on a permanent basis if this contract works out?” If the recruiter can’t answer that question clearly, tell them to go back to their client and find out! I’m certainly not saying that you should turn down any of the 3 flavors of contract jobs defined here. However, knowing what you are getting into, and managing your own expectations is key. ¹ As many astute readers have pointed out, employment laws, the “at-will” status and requirements for giving notice may vary outside of the United States. Entry filed under: Advice for Job Seekers. Tags: Consulting, Contracting, Recruiters. First of all, I visited you blog for the first time and really liked it. It was helpful. Suppose I join a job on contractual basis now and after say 1 year I want to move to some company as a permanent employee. Will the new company consider my resume (with contractual job work experience) on par with other candidate’s resumes? Or will my resume be of less weight because my work experience is contractual? The answer is that it depends on the person reviewing your resume. I think most people would think that a year-long contract job just as valuable as a full-time permanent job … but there are probably a few who would not agree, and view contract work as lower status than full-time work. However, either way – any work is better than unemployment! Is there an etiquette on contract to hire on still interviewing for FTE/direct hire positions? If someone accepts a contract to hire position but is also in the process of interviewing for a direct hire position, would it be proper etiquette to no longer continue interviewing for the direct hire position? I don’t want to burn any bridges as the professional community I work in is fairly small. You’ve asked a great question! Most employers and recruiters would certainly expect a level of commitment from a candidate who is accepting a contract position. Needless to say, it would look bad to leave a contract job mid-way through just because a better offer comes along elsewhere … and doing that does, indeed, have the potential to “burn a bridge.” On the other hand, many contract employees are seeking full-time jobs at the same time that they are doing temporary contract work. Besides the financial stability offered by a full-time position, the addition of health benefits is often the ultimate goal. My general advice is to be as honest as you can be with your employers and/or the recruiter or agency you are working with regarding your long-term goals and short-term intentions. If, as you say, you are working in a small professional community within your niche — and the contract job you are starting really does have the potential to convert to a full-time position — then it would probably be a good idea to suspend your job-seeking activities and interviews elsewhere until either the contract ends or the exact status of the FTE conversion option is determined. Hope that helps. Good luck! Thanks for the response Michael. I had another question. I made a newbie mistake when I first quoted a rate to a recruiter and just quoted a rate that was directly comparable to the annual salary I am looking for. I know what the direct salary for this contract position would be at the company and the recruiter didn’t blink an eye at the rate so I think I probably shortchanged myself about $10 /hour. I haven’t accepted the offer yet, do you think I can negotiate and do you have any recommendations on how to approach it? Assuming that the recruiter you are talking to works for an agency who would then “mark up” your rate to their client company … it’s in their best interest (as well as yours) to pay you a higher rate, rather than a lower rate. Everyone will make more money that way. You should immediately talk to that recruiter again and express your feeling about shortchanging yourself in that last conversation, and wanting to get a more fair rate based on the client company’s comparable salary. On the other hand, if you are talking to an internal recruiter working at the actual client company … then you might have screwed yourself by quoting a low rate that they like, but that you now feel was too low. In such a case, it’s tough to go back and ask for more. When a persons task/job is terminated due to government downsizing/contract expire what are the options for a 1099 or a W2 “consultant” to recieve unemployment benefits? The company is moving all full time employees in the group to a unfunded “consultant basis”. Read that as no wages or benefits. The company has their resumes, and should work be available, can contract the person to the new task some time in the future. As of 1 August 2011, a current contract expires, as does the employment. All in the group are now receiving no wages after Aug 1. Can any of the former workers receive unemployment benefits while either finding more work or being taken on with new work? Right now, there is no possibility of funded work in the short (6 months) time frame. First of all, let me give you my disclaimer: I am not an expert on Unemployment Laws or Regulations. For the best answers to your questions regarding eligibility, you should contact your local Office of Unemployment and ask them. If I had to guess, I’d say that any W-2 employee (permanent or contract) might be eligible for Unemployment Benefits if their job/paychecks end due to no fault of their own. On the other hand, a 1099 contractor is probably not eligible for Unemployment Benefits if their work stops since they are, by definition, “self-employed.” Again, check with your local Office of Unemployment for the most accurate information. If I accept a contract position, am I actually under contract to work the job for the entire duration of the contract? Suppose I get an offer for a full-time job, can I leave the job without breaching the contract? I currently have a full-time job in outside sales. Can I also take an additional commission-only position with another company? Can my employer find out about the other job through the IRS or any other general means? Do employers check to see if their employees are “double-dipping”. This would be a great opportunity for me to get out of debt and save for high school and college expenses. Part of the answer to your question kind of depends on what type of agreement you have with your current company. Some places make you sign a document during the hiring process that restricts your ability to do any other business outside of your own company. If that is the case, then what you are proposing could be in violation of that agreement — and could get you fired. Without such an agreement, it may not technically be illegal or a work violation … but as you probably can guess, it would be frowned upon by most employers who would be afraid that the work you do outside of your main job would take away time and energy from their company. Either way, if the question is would you get “caught’? … it’s hard to say. I don’t think the IRS would release information to an employer that would give you away — but there are plenty of other more common ways for your “moonlighting” to get discovered. It’s a very small world after all, and someone somewhere might see or hear about your outside work and let it slip to the wrong person. Eventually, your employer might simply hear about it through the grapevine. What happens then is the real question. If don’t think that you can be honest and simply tell your boss what you are doing — then obviously you feel there is a risk of being fired by doing what you are proposing. Tread carefully! Unfortunately, the answer to your question is no — it is not “wrong.” The truth is that even so-called permanent jobs are almost always “at will” situations — a legal term which means that they can fire someone anytime for any reason (or no reason at all) without giving advanced notice. Of course, the reverse is also true: a person can quit at any time for any reason (or no reason at all) without giving advanced notice. Contract jobs are even less secure. No matter what the recruiter told you about the 6-month duration, and no matter what the company told the recruiter and you about the expected length of the contract job you accepted … they are allowed to change their minds any time. Actually, that’s one of the reasons many companies prefer to use contractors vs. permanent hires … it’s a lot less messy for them to simply terminate a contact position than it would be to fire a permanent employee. You may never know the real reason they laid you off prematurely: it could be that business was slower than expected; it could be the work you were hired to do is no longer required; or it’s possible that they thought you were not performing your job well … or they simply didn’t like you! Whatever the reason, you really don’t have any recourse. I’ve been contracting with a family of companies for the past 2 and 1/2 years while I’ve been working on my PhD. For the past 12 months, I’ve been working closely with a team at one company, and two weeks ago another company within the family unexpectedly offered me a permanent position. The company I am currently contracting for has offered me permanent positions during my contract, but has stated that I would have to relocate. I verbally accepted the position from the sister company because I am ready to begin my career and it seems to be the best choice for my family (they are excited to have me, there is potential for upward mobility, they met all of my requirements for hiring). I don’t need the health benefits because my spouse provides them. But upon telling the contract company, I now feel like I have somehow betrayed them, and I am heartbroken to leave them. So, my question is: Am I making a mistake to leave a position I love for the benefit of a permanent position on my resume. I certainly understand your desire to stay loyal to the company that has provided you with contract work for the last 12 months. However, you certainly don’t “owe” them anything at this point. Most contract positions do not last anywhere near that length of time, and I’m sure they’ve made a ton of money by having you working for them all that time (on the mark-up they’ve been charging to the client.) However, the bottom line is that this should be a business decision … and you must consider what’s best for yourself and your family. It’s not just “for your resume.” You said it yourself: it’s a chance for “upward mobility, and they met all your requirements for hiring. ” A locally-based, permanent job is clearly the best choice for you. Thank your friends at the contracting company, and tell them it’s time for you to move upward and onward. I’m currently in a dilemma where I’d like to move up and out of my full-time administrative position (which I’ve only been at for just a year) to a project control officer role which is a contract position, but is involved in a very high profile project at the company and is also working internationally. I have posed the idea to my boss and she’s quite stringent on staying the minimal 2 years, which is expected upon hire of most full-timers. However, this contract position is a step up and forward towards my personal development in learning and skills-building for more a project management direction in future. Coincidentally, the position is within the same department and I would be working for my boss’ direct report, rather than her, so there’s a great potential to “burn bridges” if I were to quit this full-time position for a higher paying contract job… which she has already expressed much distaste for because I’d be moving from a secure, long-term role to a temporary insecure one. Your thoughts? You’ve described an interesting dilemma. On the one hand you have the so-called “stability” of a full time job (which, I assume, includes medical benefits) in an administrative position. On the other hand you have an offer of a higher paying, higher status project-related job in a contractor role (which, I assume, does not include health benefits) that is more along the lines of where you want your career to be headed. If you remove the politics and drama associated with your current boss’s “distaste” for the contract role you are being offered, the medical benefits issue, and the money … you are left with a clear choice: take the position that puts you on a better path for future career growth. Only you can answer how much those other factors weigh into the decision. How your current boss feels should probably the least of your concerns. (It’s your career that’s at stake here, not hers.) “Expecting” a 2-year commitment for all new hires may sound reasonable … but it is certainly not contractually required, nor is it legally enforceable. The medical benefits — I don’t know your situation, but since you didn’t mention it, I assume it’s not a big factor for you. Money … many people take pay CUTS to get on a better career path. Being offered a pay RAISE to do so is a no-brainer! Yes, contact jobs do “feel” less secure than full time jobs, for obvious reasons. However, as my blog posting above pointed out, no job is really secure in today’s world of “at will” hires. You could be laid off at any time, for any reason — or no reason at all. Instead, ask yourself where would you like to see yourself career-wise in, say, 5 years. Then consider: which of the two choices you are currently facing will be more likely to get you to where you want to be then? Good luck! Ok so here is my situation. I left my FT Perm position last May to go back to school full-time in another field I thought I wanted to be in. I went to school, then decided it was not the road for me. So thru everything I have had no income (I did not apply for UI because I left my co. at will and knew I would not be eligible) (also I made sure I had a nice bank acct to pay my bills during school, so i have been financially ok for that time) and have been searching for employment in my original field again. I just landed a 6-9 month contract position. My recruiter says there is possibility for contract extension or perm hire. Now say neither happens and my contract ends and have no new job again after this contract position, can I apply for UI? I did fill out a W2 form… Thanks in advance! I am trying to decide if I should leave my current FTP to take a “Contract to Hire” offer. The contract is appealing because it pays more than twice what I make now. However, I am concerned because the contract itself does not mention anything about it being a contract to hire position and the contract does not have an end date. The temporary agency is also asking that I give them 20 business days notice before terminating the contract, which seems excessive to me. In you opinion, is this a risk worth taking? If I were you, I’d ask the hiring authority (not the recruiter) to clarify their long-term intentions for this “contract-to-hire” position. In my experience, very few people leave full-time jobs — with health benefits — to go to a contract position that is not set up as a true trial period, with the intention of hiring someone full-time. Sure, more money is great … but the risk, as I’m sure you know, is that you’ll find yourself unemployed when the contract ends sooner than you expected. And the agency asking you for “20 business days notice” is not necessarily excessive, although the standard convention for giving notice is 10 business days (2 weeks.) In any case, any such agreement is NOT enforceable. No matter what the agency would like you to promise (and, of course it’s for their benefit, not yours) … the bottom line is that you are being hired “at will.” Do you think they’ll give you 20 days notice if their client ends the contract abruptly without warning? Uh … no — you’ll be out of work that day! I am in a contract with a job consultant for 1 year.The contract says that he would provide training to me & then place me with any company.There was no mention in the contract that by when he would place me.Now it has been 30 days after the training and I am yet to be placed.In the meantime I got into a project through a different job consultant which I am definite to join. Can I breach the contract with the job consultant with whom I have signed the contract?Any legal complications? The type of “contract” you are talking about has nothing to do with the contract/consulting work I wrote about in my blog article. From what you described, it sounds like you’ve agreed to pay someone to help you find a job (something I would never advise anyone to do!) If I understand correctly, this “job consultant” you “contracted” with is probably a combination of a Career Counselor who is claiming to be able to help you with basic job-seeking skills (resume writing, interview techniques, networking etc.) and a Recruiter who claims he has contacts at companies who could potentially hire you after you take his “training.” Both Career Counseling and Job Placement services are available for free from multiple sources. The average job-seeker should not be paying anyone for those things. That said, I have no idea what the “contract” you signed says … so I cannot possibly comment on whether or not you would be in “breach of contract” or have “legal complications” if you got placed in a job by someone else. My guess would be that this person you originally “contacted” with is only interested in getting paid by you! If you’ve paid him in full, he’d probably be happy to see you find a job any way you can. If you haven’t paid him in full yet … he’ll try to claim that you still owe him money. You should probably consult with a lawyer to get more accurate advice. I just accepted a contract-to-hire position with a large company. Once my contract ends (in 3 months) and the company decides to hire me full-time, would it make sense for me to ask for more money or should I expect a pay cut since I’ll be getting benefits from the company? I know I have the choice (as well as they do) to leave the company after the 3 months so I would think they would be willing to pay me more to have me stay instead of hiring someone else and training them. Am I wrong to think that? Just wondering what my options are, any advice is much appreciated! Contract jobs are usually paid on an hourly basis, while full-time “permanent” jobs are generally based on an annual salary which usually includes benefits. That said, I’m not sure how to answer your question. “Asking for more money” than your contract rate is not a concept that easily applies here — it’s kind of like comparing apples to oranges. All that should really matter in evaluating whatever offer the company may end up giving you is how that offer compares to your own salary expectations and requirements. If you think you can get more, it certainly can’t hurt to ask … but don’t price yourself out of the market. More importantly, know your own bottom line and be prepared to either settle or walk away. Hope that helps. I was hired by a small company to do data entry. I didn’t sign any contract or anything and my paycheck is not deducted of tax. I was also informed that I’m only hired as a contractual, but no end time. Could I still use it as a work reference on my resume? It’s my first job since I graduated. Thanks! Yes … any job you do, whether it is a temporary contract, permanent, full-time or part-time, is worth listing on your resume and using as a reference. That is especially true for a recent graduate with little or no experience! What happens when you have that contact and then the client wants to change the contract mid-way without Notice. Example I was working 40-50 hours per week then my contract was supposed to be a minimum of 30 hours and they want to do 15 hours… But my original said minimum 30 hours. I also did not sign the new Work Authorization because I was give no notice and the other contract is still in place isn’t it? I’m not sure what that “Work Authorization” you spoke of is (unless you are either under 16 years old, or not a U.S. Citizen) … but you need to understand that the very nature of contracting is that it is temporary, and there is certainly no enforceable guarantee in terms of the number of hours you are promised or the length of the engagement. It is not at all the same as a legal “contract” that you sign binding two parties to an agreement. Rather, it’s similar to an “at will” hiring situation. In a contract job your hours can be randomly increased or reduced, or you can be terminated at any time — with or without notice, with or without explanation. There’s really not much you can do (other than quit) if your employer decides to change your hours. Excellent blog posting! I have a few questions regarding out-of-town consulting positions that are being offered on a contract basis. Background: I’m temporarily located in a market with few jobs matching my consulting experience but I have some flexibility in regards to where I can live/work now and in the future. Within the past few months, I’ve been contacted by recruiters regarding several 3, 6, and 12 month contracts for out-of-town consulting positions. Most recently, I interviewed for a 6 month contract (with the intention to hire) in a city that is a few timezones away from my (temporary) home and wife. I’ve never worked as a consultant/contractor in an out-of-town setting. This said, what questions are appropriate to ask RECRUITERS regarding relocation, housing stipends, per diems, travel/time off allowances & assistance, etc.? If I land an interview with the CONTRACTING COMPANY, what questions should I ask of them? I typically have been asking the recruiters if relocation is included. In the handful of positions mentioned above, it has never been included. I’ve also asked about per diems and they have also never been included. What has been included: Only an hourly wage. With your experience in contracting positions, should I drop the relocation and per diem questions when talking to recruiters? Can I ask the contracting companies about these incentives? I basically don’t want to sound like an amateur as I’m sure I’m competing with both local consultants and those that have worked out-of-town before. Any help would be greatly appreciated. Thank you! In my experience with contract positions where someone is brought in from another location to perform temporary (contract) work at a client site, there is almost always some accommodation for covering travel and lodging expenses. Those expenses are either reimbursed by, or billed directly to the client company where the work is performed. Some companies even have special arrangements with local extended-stay hotels where they house their out-of-town contractors. Per diems (for meals) are also sometimes included — but not always. Those extra expenses are generally considered to be outside of the hourly wages paid to the contract workers. If the contract positions you are considering do not include travel or lodging, then obviously you’ll need to take pencil to paper and calculate how much it will cost you to travel back and forth to the work site, how often you’d be coming home, how many days per week/month you’d be there, and how much it will cost to stay there during those work times (airfares, apartment rent, extended-stay hotel, etc.) After subtracting whatever those costs would be from the hourly wages they are offering, you can then make an informed decision about whether or not it’s worth it based on what your actual take-home pay will be minus those expenses. In any case, yes you should absolutely ask any recruiter or potential hiring manager about covering those expenses for a contract job. One way or another, someone will incur those expenses. The only question is who will pay for them! If it’s you, the bottom line is that after you do the math — it may not be worth it for you to accept that job. Permanent positions, on the other hand, are a different story. When a company makes a direct offer to someone for a full-time permanent role, there could theoretically be a “relocation fee” that is thrown in to cover moving expenses for someone who lives in a different city and has to pick up and and permanently relocate … but those relocation packages are getting more and more rare in today’s world. Like “signing bonuses,” stock options, equity stakes and other hiring incentives, nowadays they tend to be reserved only for the highest positions in a company (CEO’s, etc. ), or for extremely high-demand/low-supply skill sets. Again, it never hurts to ask … but it’s less likely to be a standard part of a company’s hiring package for full-time positions. Hope that is helpful. Good luck! I am currently working a salaried FTE position that’s outside of my field. I am being offered a Contract with the Possibility to Hire (with benefits through an agency) position in my field which would require me to relocation. The duration of the contract is a year. What questions can I ask to ensure that I am well compensated and to ensure taking the risk is worth it for me? Are sign-on bonuses normal for contract work? You mentioned leaving a FTE position is rare. But in this case, would you recommend considering it and possibly taking it for the right reasons? I would appreciate any advice you can offer. By definition, any contract job is less secure than a “permanent” FTE position. So naturally, yes there is a risk in leaving such a FTE position to take a contract job — even if it has the possibility of becoming permanent somewhere down the line. Needless to say, there is no guarantee that the contract will end with an offer for full-time employment … and you could end up out of work when the contract ends. However, having said that, if your main priority is to get back to a job that is “in your field,” then it’s a risk that may be worth taking in your case. And the fact that the agency is offering benefits certainly lowers that risk. Thinking “long-term” and focusing on your career goals instead of “short-term” expediency is a very good way to go! Signing bonuses are another story. I’ve never heard of a signing bonus for a contract job. Hiring incentives like that are almost always reserved for full-time permanent positions … and even then, nowadays they tend to be reserved only for the highest positions in a company (CEO’s, etc.) or for extremely high-demand/low-supply skill sets. As far as what questions to ask … you should read the comment just before this one by Maryland C (and my response) regarding another situation where relocation is involved. Beyond that, it all boils down to what the hourly pay scale is for the contract, what the projected salary might be if the job became permanent (if that can be determined) and how those compare to your own personal salary requirements. Hi Michael – I am currently in my 5th year of yearly contract work. The agreement I signed says I can’t go after a position within the company I am working for until I am done working with my contracting company for 1 year. Are you aware of any way around this? Do you know of any ramifications if I did? legal? fees? Can I or the company I work for buy out my contract? Is that usually a percentage? I’m not a lawyer, so I wouldn’t be able to comment on any potential legal ramifications of breaking the “non-compete” terms of the agreement you signed. (And without seeing the exact language, no one could.) I can tell you that it’s not unusual for a contract/consulting firm to build in a “buy-out” clause for their client companies who might want to directly hire one of their consultants. That usually involves the client paying a fee to the firm for the buy-out. That could be a percentage of the person’s full-time salary, or a flat fee. Those buy-out terms would be spelled out in the agreement that the client signed with the consulting firm … and most likely not in the agreement you signed. Therefore, you probably would not be privy to that buy-out information unless either someone at your contracting firm or at the client company volunteered to share it with you. I am in the process of being picked up by a large company. During my interview, the Director informed me that he was told by the parent company they are going to relocate the entire department, and will be hiring this position as “Contracted” for a year or two, then re-hiring at another location. I can apply as an “internal” candidate for this (and, I assume, any other?) role when this transition occurs. My real question comes from the fact that I have developed rapport with the hiring manager at the company directly at this point. Now that person is trying to find out the “agency” information, and a “contact for me to apply for the position through the agency”. Does this mean I will have to go through another full interview process with some outside hiring agency? Or just a formality, and he/she will have the ultimate say in the hiring decision? Thank you in advance for your attention! It’s hard for me to know for sure, since I don’t know all the details of your particular company and the relationship it has with the “agency” they are using to run their contract employees through. However, I have seen similar scenarios before where a company uses an outside contracting agency to basically “payroll” their temporary employees. That outside agency may or may not want to “interview” you, check your references, do criminal background checks, etc. However, typically the decisions of who to hire in those types of situations are made by the actual company you’d be working at and their internal managers — not the outside agency that is payrolling them. Also, those scenarios generally do not include the same benefits (health insurance, etc.) that a regular full-time employee would get. More importantly, the overall status of your employment will be far less secure as a contractor than it would be if you were a direct full-time hire. After all … that’s kind of the whole point of such an arrangement! The company can terminate a contractor’s employment at any time with no HR ramifications. It would be far more complicated to terminate a full-time employee. Those are all factors that you should ask about, and be aware of in making your decision. When the company you are hired for offers you a spiff for going over and above beyond quota and then decides that is not what they meant and offers you a new comp plan for the following year for less money, is ther any recourse? The original spiff was never in writing and I was realeased because I said it was “unacceptable and I would be discussing it with their H.R. For the last 5 months I was well over 100% of quota, and one month 198%..The spiff was for 3 months of over 100% with at least 20 opps, which I always attained and a large number of leads have moved upward to other levels and with some closing. I am not an attorney, nor am I an expert on employment law. I cannot even begin to guess whether or not your employer did anything illegal without at least seeing the language contained in whatever hiring paperwork you and they both signed. I will say that if, as you said, the exact terms of your comp plan were not in writing … well, you probably have little or no recourse. Sales organizations are notorious for changing the comp and incentive plans for their sales people when they actually start to attain the goals that were originally set forth. It’s an old story — constantly moving the goal posts to be just out of reach. It does seem illogical when a company dis-incentivizes their best sales people instead of simply rewarding them to keep them happy, but it happens all the time. Complaining about their “unacceptable” practices, and saying you would be “discussing it with H.R.” may indeed have been the reason you were fired. However, if you were hired “at will” then none of that matters. You can be fired any time, for any reason — or no reason at all. Sorry — I wish I had better advice, but it’s likely that there’s nothing you can do other than start looking for a better company to work for with your excellent sales talents. Hi.. recently I got a mail from a consultant , giving me the requirements and asked me that” let me know what type or rate you are targeting (are you Incorporated? )” what does it mean..? Specifically “Incorporated”..? Thanks. Many self-employed consultants form their own legal “corporations” for the purpose of billing client companies for work they perform as independent 1099 contractors. Under such an arrangement, the company they work for would pay their “corporation” instead of them personally. One of the most common types of corporations is an “LLC” (Limited Liability Corporation.) There are various tax advantages to setting things up that way — for instance, being able to deduct certain business expenses like a home office, laptop, phone bills, travel expenses, etc. You should consult a tax specialist and/or an attorney for more advice and information on how this works, and whether or not it makes sense for you. Thank You for your response. So are they asking that my company shall complete the project and they will pay me on per hour basis or I have to work in premises of that company and complete the project..and they will pay me on per hour basis? Thanks. I don’t really know for sure, but they seem to simply be asking if you have a company (“incorporated”) or not. Either way, you could probably still be paid per hour at whatever “rate” you agree upon — with or without being incorporated. You need to find out if they prefer to work with you as a “1099 contractor” or as a “W-2 contract employee.” As I explained in the blog above, 1099 contractors get paid by invoice with no taxes taken out, and W-2 employees get paid by regular payroll with standard deductions (taxes, etc.) already taken out. I have been working for a company on a contract-to hire position. The length of the contract was three months. The three months ended four weeks ago and I am still working there. My immediate manager told they are planning on hiring me FT. He said the paperwork was being pushed through two weeks ago. Although I have not gotten anything in writing yet. In that time period, I was contacted by another company for a FT position. I interviewed for and got the job. I am fearful that when I tell my current employer that I accepted an offer elsewhere, that I will be asked to leave the same day, thus lose two weeks worth of paychecks. Am I required to give my current employer two weeks notice, even though my contract ended? Thank you so much for all of the information. I especially appreciate you taking the time to provide speculative answers or items to consider when all the details are not available. I am interviewing for a contract position (12-14 months) where I would be hired by the contracting company, and provided benefits. I was given the option of working for an hourly rate or a salary. The contracting firm told me the job would be “straight 40”. However, during a phone interview with the original hiring manager (which has since changed), the job would require some “heavy duty hours”. I had initially verbally agreed with the firm for a fixed salary that was equivalent to the billing rate for a 40 hr week. I will be confirming the hours with the new hiring manager today, but expect the same answer given by the previous hiring manager. This would be my first contract position, so I would like your thoughts. Could you also clarify how you typically “do the math” – salary vs. hourly? I understand there would be a certain percentage increase expected if there were no benefits. Thanks again for your time and such a very useful website. First of all, thanks for the kind words about the blog and my attempts at helping people through these comments. It’s always good to know people benefit from my articles and follow-up comments. Your question is quite interesting. If I were in your shoes, I’d try to go back to the recruiter at the agency that is hiring you with the new information about the longer hours that you uncovered, and try to renegotiate the deal you initially made. Obviously, if you are on a fixed salary and end up working way more than 40 hours per week, your effective hourly rate will be much lower in the end. Some things to consider: whatever you get paid, the agency will then “mark it up” to a much higher number and then bill the client company. That’s how they make money on the deal! If you switch from salaried to hourly (and work more than 40 hours) then you’ll get paid more, and the agency will also get paid more — so for them it’s a win-win. However, the client company will then have to pay more for your services! That may or may not be a problem for them. Keeping you on a fixed salary is better for the client because they can then expect you to work longer hours without paying extra for your time. Medical benefits are a separate issue. Yes, in general you’d probably expect to get paid less if they are also covering some or all of your health benefits. If you get no benefits, you should get paid a higher rate. None of that matters to the client company. They only care what they are paying the agency for your services, and have nothing to do with the benefits issue. Thank you very much for the quick reply! I did mention it to the recruiter following the onsite interviews. It was again clear it would be “heavy duty hours.” We agreed they would verify it with the hiring manager. He was traveling and I was unable to meet with him. Thanks! Should I apply for some of them as I would be external candidate? Before the assignment ended I was set up and was tested on how good my repairing skills were, unfortunately I by accident broke a piece of the equipment because of my lack of experience in this area. I’m not sure I understand your question. If you are qualified for any of those new jobs you saw listed online, then why would you not apply?! (If, on the other hand, you are NOT qualified and do not have those special skill sets they listed as requirements — then do not apply!) Are you worried that the staffing company you contracted through would feel they should represent you instead of you applying directly? That’s a different question altogether, and would depend on what type of agreement (if any) you signed with that staffing company. The jobs don’t require years experience just knowledge and understanding.. Don’t know if I should apply because when I was working as a contractor, I applied for position for which I was qualified and received a notice that selected another person.. Should I just move on from this company?? Clearly if they wanted to hire me on after six months they would have done so by now. Am I right by this assumption? If you feel you have that knowledge and understanding … then apply! If not, then don’t waste your and their time. This is pretty basic stuff. Only you know if you are really a fit for these advertised positions. Since you are already known by the people at this company from your contract work there, I would advise you to reach out directly to the supervisor who said he would bring you back full-time if the work picked up and ask if you could be considered for these new openings. What’s the worst that will happen? He’ll say no. At least then you will know and move on to other things. He might just say yes and help you get back in. If you don’t try, you’ll never know. If your prior work there was well regarded, that should help you. The fact that you were not selected for another position at that same company may or may not be a sign that you are not wanted there. Until you ask, you’ll never know. I don’t have the supervisor phone number, basically I was never given a warm reception there meaning I was left out of dept meetings,no communication etc..
Wow … more negatives! Between this, your being passed over for another job there, and your story about breaking equipment during a test — it sounds like you should just move on and find another place to pursue work. I try to be positive but in this case, I think your right. I looked on Glassdoor for this company and it reaffirms my decision to move on as of today including from the staffing firm. Besides if the company wanted to hire me they would have done it by now.. Their loss not mine.. I wouldn’t mind writing a post or elaborating on a lot of the subjects you write concerning here. Again, awesome blog! Thanks so much for your kind words of praise. It’s always great to know my blog is helping people! I don’t really use “guest writers” … but I’d welcome any suggestions on subjects that you’d like to have me explore in future articles. Hi, Michael. First off, this was a very informative post for me as I’m just entering the ‘real work field.’ I’m applying for a job with a large government organization and it’s overseas in a country I’ve been volunteering in for the past three and a half years. From the job description, it doesn’t look like they cover any relocation expenses, there’s obviously no healthcare or retirement benefits either and the contract only lasts 90 work days (about 4 months). Now, I have a pretty good feeling I will be getting this job because of my contacts and proven work record alongside this organization, but I’m not sure what going rates for these contractor/consultant positions are with my lack of work record. I looked up some average salaries and the annual average was around 70k, but that’s for much longer contracts. I’m a great candidate and know I will excel at the job, so I don’t want to shortchange myself, but I also don’t want to scare the employers off with my proposed salary (daily rate, the max is $400). Do you have any rules of thumb for what to expect pay-wise when doing these short-term/overseas contracts in comparison to the long-term salaries? Thank you! Sorry, but I really don’t have much experience with short-term/overseas contracts. I can tell you that in general, when I help candidates determine what their hourly rate should be for a contract job, I advise them to simply take their targeted annual salary and divide by 2. For example, if you are targeting $70K annually, that would translate to about $35 per hour for a contract job — give or take a couple of dollars. That usually does not include health benefits, and is separate from travel expenses, per diem for meals, or any other perks. In your case, with the additional factors of having to travel overseas, living away from home for 4 months, etc. … your guess is as good as mine for what that’s worth. Wish I found your blog 3 years ago when I started contract work. Been with 3 agencies so far, and have had great recruiter experiences. They seem to work hard and go out of their way to keep experienced IT relationships, even after you leave their agencies. Have you ever heard of a client company asking their contractors to take week(s) off unpaid? aka a rolling layoff. I just left a 2 year contract after 9 months when they asked us to do that, just as they’ve required from their FTE’s. I was the only contractor who thought they were nuts to ask. We were told we could file unemployment – so basically, the taxpayers foot the bill for this time-management style. Also, can you spend some time discussing a typical scenario for contractors vis-a-vis feeling/being treated as an outsider? My new contract has been like all the others I’ve had … the FTE’s are friendly and helpful with the 1st 1 or 2 days introductions, but afterwards, they give minimal help if I ask for assistance. I don’t think I come off as unfriendly or a know-it-all, but most of the time I feel isolated. Guess its human nature for employees not to get close and personal when you know someone will be gone in a few months. Took me a while to figure that out and not take it personally. When I was an FTE, I made sure to go out of my way to help and even befriend contractors. Made some nice relationships for my network that way. But as a contractor, I feel like I’m forcing things if people want to keep their distance – which most do. Do you agree this is common, or am I being overly-sensitive? Maybe it is common and I need to develop thicker skin. 1) Asking contractors to stop working for a period of time, and then bringing them back later is not uncommon. There is no requirement or obligation on the client’s part that they keep you working continuously — that’s part of the attraction of using contract resources in the first place. From the company’s point of view, you represent a totally flexible work force. As to you filing for unemployment during your off weeks — it seems to me that deciding if it’s worth it would depend on how long you will be out of work, and when they plan to bring you back. There’s usually a 1-week waiting period for unemployment benefits, and then you’d only get paid until you start working again. If the company plans to have those “rolling layoffs” more than once, getting those benefits to stop and re-start over and over may be problematic. You should contact your local Unemployment Office and discuss the particulars of your situation with a representative there for better advice. 2) As to the issue of contractors feeling like outsiders … it sounds like you’ve pretty much answered your own question fairly well! As I said in the blog article, contractors rarely have the same feeling of “ownership” of their work that permanent employees usually have, nor do they enjoy the same feeling of camaraderie with their co-workers that permanent employees usually feel. It’s just one of the common aspects of that type of work arrangement, and basically just human nature. Not much you can do to change that, other than what you have already articulated. I am unfamiliar with the etiquette of temp/contract jobs. I was offered and accepted a temp position through a 3rd party state contractor. I have not started the position yet. Today, I was contacted by the state, directly, and offered a permanent position at a different location. The permanent position is my goal as I would like to have state benefits and paid vacation. Would it be inappropriate for me to now take the permanent position, instead of the contract job (which I have not started)? It’s usually not a good idea (although technically NOT illegal) to back out of a contract to accept another position elsewhere — especially once you start that contract. However, in your case since you haven’t actually started the contract, I would IMMEDIATELY contact the person you dealt with for that contracting position and explain the situation — and tell them you are withdrawing from the contract to accept the full-time offer. That is an obvious and better choice. Hi Michael, similar to a previous post, glad that I found your blog about this important and growing trends on consulting/contracting. Similar to many, I was impacted with a reorg and ended up being for the first time in my working life of over 19 years “in transition”. I was approached for a consulting job and after some regular interviews I was offered this contract position for 1 year with the opportunity to become permanent. Similar to these readers, the contract was intended to become a permanent role. I started and after many attempts and lot of work, the project is not approved, project team was assembled but all are now engaged in other projects, senior leadership is not warmed to the idea and the total investment after being reduced from mid double digits of millions of dollar now sits with low double digits and still not approved and skepticism at the leadership level. Today the agency contacted to tell me that b/c of the project status – unknown and no consensus to be approved yet – my contract is now extended month by month with the hope that the projects gets interim funded for additional work until formal business case is approved. This puts me in a difficult position as the client can tell me in 2 weeks that my contract is over…but I still need to be fully committed to the work. Having just one year as a independent consultant, does this mean that most likely this will not proceed? there is no discussion about long-term and sometimes it seems that the project will move with internal resources (full time) based on the work, impact and strategic roadmap I delivered so far. I have not discussed this with the VP but over the past 3 weeks, I am working and passing a lot of information to a director who most likely will take over when I leave…Your comments on how to handle this situation is appreciated, I have lots of work in front of me but a great deal of uncertainty….the company has no hiring freeze and is currently actively hiring but outside the area that I was hired for. I am afraid that the writing is on the wall and have some optimism that will never come forward. I have no way of predicting what the future may bring in your situation. I will tell you that all contract work, by definition, is temporary … and there are certainly never any guarantees of future permanent employment — even if you were told that it has “the opportunity to become permanent.” Good luck! If someone signs a three month contract with an employment agency and they later find their own full time permanent job unrelated to the temp agency job are they legally bound to complete the temp job? Will they or the new company have any issues? “Legally bound” … no. (Generally speaking, contract jobs are “at will” hires – a legal term which means that you can quit anytime for any reason — or no reason at all — without giving advanced notice.) However, it is considered very unprofessional to give a commitment to complete a 3-month project and then abandon it early because you received a better offer for another job. On the other hand, I do understand that a permanent job trumps a contract. Have you discussed the possibility of pushing back your start date with the new company so you can complete your 3-month contract job? Most employers would respect the fact that you are at least trying to honor your commitments. Your blog is very informative. Thank you very much for providing this information. My current full-time job is being eliminated and I am searching for new opportunities. I have been contacted for consulting opportunities. These are short term opportunities (2-3 months) on W2 and the contract with the consulting company says that once the assignment with the client is complete, I cannot apply for another position with the same client for a full year. Is this legal? Is it a standard clause in every contract? First of all, my disclaimer: I am not a lawyer … so anything I say is merely an unofficial opinion. You should consult an attorney who specializes in employment law for a more informed opinion. That said, my opinion is that a consulting company cannot prevent you from applying for a job directly with their client once your contract period ends. Any restrictions like that are usually written into the agreement between the client and the consulting company. It is customary for such an agreement to include a conversion fee if the client decides to hire a consultant after a contract period. That fee would be paid by the client — not you, the consultant! I doubt they can legally restrict your ability to apply for a job. If they ask you to sign something that restricts your future ability to apply for a job, it’s probably not enforceable — although that may vary from state to state. I have a permanent contract with the company I work for, and have recently changed from full-time 40 hours, to part-time due to my attending a college course. I was informed I would be guaranteed only 20.5 hours per week due to availability, which I was happy to agree to and requested a copy in writing. They have now agreed to an extra 2 hour shift per week, resolving the pay issue in the future, however I have still lost a lot of money due to the prior rota’d hours. My question is whether my employer is obliged to pay me the missing 6 hours wage for the previous months? Whilst it does not seem like much, it’s nearly a full days pay per month when money is already tight, and I am missing these hours through no fault of my own. I’m just concerned that they will dispute it due to not having the paperwork as proof. I suggest you consult with an attorney who is familiar with employment law for better advice on your situation. My own lay opinion is that there is no such thing as a “guarantee” of hours from a company to a contract worker that can be enforced. You were most likely hired “at will.” Their only obligation is to pay you for the hours you actually work. Your hours can be increased, reduced, or eliminated any time by the company with or without notice or explanation. Expecting to get paid for extra hours you think you were promised, but didn’t actually work, sounds unreasonable to me. My boyfriend was recently contacted by a recruiter and decided to go to the scheduled interview because it has been so long since he interviewed. (he has been in the same ft position for 7 or 8 years) He was not actively looking for a new job per say but was not closed to the idea either. Long story short…he went to the interview and got the job with a considerable increase in pay. He is confused by a few things though, He was told by the recruiter that the recruiting agency would be supplying him with healthcare benefits and that he would be on a 4 month contract with the agency. Does that mean that the position is a contract position or is that just the duration of time that the agency is involved with the hiring process (in order to get their cut). I guess I am asking if this is normal or should he be asking certain clarifying questions and what would some of them be? If your boyfriend was told he would be on a 4-month contract with the agency, and also be getting healthcare benefits from that agency, then this is clearly a temporary contract position! He is being hired by the agency — NOT the client company he interviewed with. (If this were a standard full-time placement by the agency, they would collect a one-time placement fee directly from the client company — not by starting out with a 4-month contract period.) Quitting a full-time job to go to such a temporary contract situation is not smart, and is very risky. Unless there is an iron-clad guarantee that the client company will absolutely hire him at the end of that 4-month contract — and he has that in writing — I would NEVER advise making such a move. So-called “Temp-to-Perm” jobs are almost never given such guarantees. The obvious risk is that the contract might end in 4 months, and he’ll end up unemployed. That “considerable increase in pay” could easily become a big fat zero after the 4 month period ends! In most cases, the only reason for a full-time employee to quit one job to go to another is when that other job is also a full-time permanent job. It’s difficult to advise you on which one (or both) of your contract job options is the best choice, mostly because each situation is unique and I’m sure each of the jobs you are describing has other pros and cons that factor in. If either one has the possibility of converting to perm, and/or is in your chosen career field, those would certainly be attracting factors. Two jobs at once is obviously a bigger time commitment, but also more money in your pocket … so if you are in a situation where income is critical, then two part-time jobs that add up to full-time hours could be a good option. The perm job you “applied to” sounds like a total long shot, since you don’t know if they will even interview you. I certainly would NOT advise you to hold off on accepting any other contract jobs based on waiting for that one! Hi there. Is it possible for consulting jobs that are non-w2 to show up on an “Employment History Verification” background check? I’m not sure what you mean by “non-w2” jobs. Are you referring to 1099 independent contract jobs that you perform directly for client companies? Either way, my understanding of how background checking companies verify your work history is that they individually contact each of the companies that you list on your application form and verify the information you provided (dates of employment, salary, reason for leaving, etc.) As far as I know, there is no master “database of employment” that would reveal a job you might have had that was not listed on your application. Of course, it is always possible that such a “hidden job” could be uncovered through a look at your tax records, or some other more intense investigative method. Police Detectives or Private Investigators would probably have no trouble uncovering such information. However, standard background checking companies would not go to that depth in verifying your employment. “Contract / Consulting Jobs Explained … Available in Three Different Flavors” on Recruiter Musings ended up being quite enjoyable and educational! Within modern society honestly, that is very hard to deliver. I want to know that if i m hiring 1 person as a consultant on contract basis .If the person name entered in the attendance sheet & all the policies are applicable to him as a common employees in the organisation.Is he comes under employee or under consultant ? I’m not sure I understand your question the way it was written. However, if you are hiring an independent contractor (someone who is NOT on your regular payroll, and for whom you are NOT withholding taxes, etc.) then that person is not your “employee.” They are self-employed, and must pay their own taxes. If you are hiring a contractor through a consulting firm, then that person is most likely employed by that firm and not by you. Michael and other readers: Question about out-of-state income taxes: I have changed my employment from W2 contracting (through contracting agencies) to my own consulting LLC. I have worked in 3 different states but, mostly work in my home office from which I deliver my services to the clients via email. Approximately 1/3 of the year was spent on-site in these other states, sometimes for as much as 3 weeks at a time. My question – Do most states require that an outside consultant pay state income tax for the time he was physically in that state? You’ve posed an excellent and very complicated tax question. It not only involves state taxes, but also applies to local city taxes for consultants and other professionals who travel and work in multiple locations and live in another. Is your tax burden tied to the site where the work is performed? To the location of the client company’s headquarters? To the location of the home office of a self-employed consultant? To all of the above? The tax laws might vary from state to state and city to city. I am certainly no expert in this area. I suggest you consult with a qualified tax accountant who has experience in matters like this. I wouldn’t want to guess on this one! I was employed as a contractor through an employment agency. I left that contract position when I was hired by another company full-time simply because the pay and benefits were better. I found out after leaving that the company was giving my employment agency around $36 per hour for my position, and I was only receiving less than a 1/3rd of that. My old company would like to hire me back and I would love to return; however I signed a contract with the employment agency that I would not work for the company without their representation. I feel vulnerable and misled after taking a position I desperately needed at the time, and finding out how poorly I was treated. The employment agency also offered no other compensation such as paid days off when the office was closed, etc. I was certainly not expecting Holidays. Is this common place? Is there anyway I can return to this company without seeking a position through the job placement agency? I’m not a lawyer. You should consult an attorney who specializes in employment law to find out if that “contract” you signed with the agency is actually legally binding or not. My own unofficial opinion is that it seems wrong that an agency can prevent you from accepting a full-time position offered to you by one of their client companies after you ended your assignment with them and took another job somewhere else in between. I think that if such a thing occurred, at most that client company might owe the agency a fee for “converting” you from a contract to a permanent employee. Such conversion fees are usually built in to the agreement that client company signed with the agency before they hired you as a contractor. In any case, a lawyer should review your contract to determine its enforceability. It may not be legal at all — but right or wrong, anyone can sue anyone else for anything! If you accepted that job offer from their client and the agency wanted to be vindictive, they could drag you into court just to prove a point and force you to defend yourself at your expense! I’ve seen that happen more than once. In the end you might win, but who needs that headache! As to the fee issue — it is pretty standard for contractors to be paid a much lower rate than the hourly bill rate charged to the client company for your services. Such “mark-ups” are exactly how the agency makes their money! Typically, the bill rate could be 1.5 to 2 times the pay rate. In your case, if the bill rate was actually 3 times the pay rate … well, that is excessive by most industry standards, but certainly not illegal. And agencies almost never pay contract consultants for days off, vacations or holidays. Those are perks usually only given to full-time employees. Typically, contractors only get paid for the days they actually work. To conclude that you were “misled” or “treated poorly” based only on those facts may be an overreaction. There may be other things they promised and didn’t deliver on — but you didn’t mention anything else. I’m in a temp-to-hire with a large company. The thing is my agency told me that their contract period with me will be in 6 months, while the company is saying 90 days I will become their permanent employee. Notice that there is not any provisions stated like that in the contract between the agency and me. Which one is correct? Is it possible for me to become permanent employee and still get paid hourly from the agency? Is it illegal for them to keep me work under their agency for 3 more months? First of all, you cannot work at a company as both a permanent employee and also as a contractor at the same time — that would make no sense. You are either one or the other. Secondly, it is certainly not illegal for a contract to last more than 3 months. I’ve seen contract jobs last for a year or more. It all depends on if or when the client company decides to either end the contract and/or hire a contract worker as a permanent employee. If the company you are working for now wants to hire you directly after 3 months, and the agency you are working through expected the contract period to last 6 months, then the company and the agency will have to work that out. There is typically some sort of “conversion fee” that the company has agreed in advance to pay to the agency when they hire one of their contractors. What you need to understand is that agencies usually make more money from contractors than from those conversion fees. It’s more profitable for them to extend your contract period as long as they can. The bottom line is that the company and the agency need to come to terms before you can be hired. Thank you Michael. It helps a lot. I am new to the engineering consultant world and am paid good hourly rate. Are there unwritten rules related to number of hours to enter on time cards for contract employees? I typically work much longer hours than I record on my timecards, but enter 40 hours. I do keep track of the extra hours. What do Contractors/Consultants generally do? I would like to get paid for the extra hours but don’t want to ruffle any feathers. There are no “unwritten rules” regarding work hours. Quite the opposite: labor laws spell out quite specifically what your pay should be paid for the hours you work. If you are working directly for a client company as a 1099 independent contractor, then you should have a written contract that specifies how many work hours your client is willing and able to pay for each week (and what rate they’ll pay you), and then you bill them accordingly. If you choose to work extra hours over and above what they agreed to pay for, that’s up to you … but you’ll be working for free! On the other hand, if you are working through (and being paid by) an agency as a W-2 employee, and then being billed by that agency to their client as a contract/consultant — in those situations the typical arrangement is for a “straight time” hourly pay rate for up to 40 hours each week, and then “overtime” pay for any hours you work past 40. Generally, overtime pay is 1.5 times the straight-time rate … and almost always has to be approved in advance by the client company. The bottom line is that whoever pays you should be made aware of how many hours you are working, and you should be compensated for those hours. Otherwise, if you work overtime hours without being paid — then someone is taking advantage of you! I am currently working as an independent contractor with a 12 month agreement. In the agreement, it says a 90 day notice needs to be given to terminate. The company knew my ultimate goal was a permanent position, which they could not offer at that time, but said possibly in the future. I interviewed for a perm position but they said they would not move forward with an offer without me being able to start in what they consider a reasonable timeframe (2-3 weeks). Do you know what can happen if I do not give the 90 days notice? Thanks! I’m not qualified to give legal advice. Plus, local employment laws may vary. I would advise you to consult with an attorney who can review the “agreement” that you signed to see if it is legally binding, and what the possible consequences might be if you do not give 90-days notice. I will say that in my experience in the staffing industry, demanding a 3-month notice period sounds excessive and unreasonable. Naturally, it’s in that agency’s best interest for them to keep you on the job and billing for them as long as possible … so they can write anything they want into that “agreement” they gave you. However, if you were hired “at will,” then there is no legal obligation at all to give any notice — you can quit at any time, without giving any notice. (And that works both ways — you can also be terminated at any time without notice!) The custom of giving 2-weeks notice is merely a professional courtesy for an at-will employee, and not a legal obligation. Hope that helps. My wife is currently waiting for an offer letter for a permanent position that she should have tomorrow. She was also offered a 12 month contract position on the same day and they are telling her she needs to complete the paperwork by tomorrow for the offer to stand. Obviously she would prefer the full time position as we are both currently unemployed and we need medical benefits. If she completes the paperwork for the contract position on Monday and receives the offer letter for the permanent position a day or 2 later and accepts , is she obligated in any way to keep the contract position? I think you mentioned something about “at will” in previous posts, but I don’t want her to go from 2 job offers to nothing at all by not signing the contract because of the possibility of an offer letter for a full time position. You insight would be great if you can provide. Without seeing the language of the paperwork your wife would be signing for the contracting situation, it would be impossible to comment on how legally binding such an agreement might or might not be. (And anyway, I’m not a lawyer!) However, in my experience — almost every contracting situation is an “at-will” hire, meaning that either party can terminate the agreement with or without notice no matter what that paperwork says. While quitting the contract after signing on would certainly not make the client or the staffing firm happy … withdrawing a day or two after completing the paperwork would be a lot less harmful than doing so after starting a project that a client would then be depending on her to complete. My advice would be to play it safe and complete that contracting paperwork — and then withdraw immediately if the permanent offer comes through. And, of course, if that perm job doesn’t come through … at least she will still have the contract to fall back on. We currently live in Florida which I believe as an “at will” state. We definitely do not want to do anything that would possibly burn any bridges, but we also do not want to be in a situation where she ends up still being unemployed. I am hoping she has that offer letter for the perm job first thing tomorrow morning but that may not be the case. I recently started as a nurse contractor for a manufacturing plant (5 days ago) and am just finished my first week of training. My employee agreement doesn’t have a specified contract length, it just says that “the employee agrees to give (10) days notice of intent to terminate assignment”.. later on in the agreement it says that “either employee or employer may terminate employment relationship at will, at any time, with or without cause or ADVANCE NOTICE”. This confuses me because both phrases seem to contradict the other. Am I required to give (10) days or not? After this first week on the job, I can not see myself going back. Could there be legal repercussions if I resign without notice? I mean, even if I did give notice it would be pointless since the (10) days will consist of more training for the position I was to start working in. You are right — the way your agreement is written it does sound like a contradiction. However, your “at will” status is very clear: no notice is required, no matter what other language they added. There should be no repercussions is you leave after one week with no notice. Hi Michael, great article! I was hired FT by client company after consulting there in IT for almost 3 years through a recruiting agency. Unfortunately, after having worked there for 4 months, the company faced a sudden revenue loss and I along with many were laid off due to reduction in workforce. Now, the same client wants me back as a consultant so they contacted the same former agency. I just recently started my own one-person LLC. I have a good relationship with the client. However, the agency does not give me any benefits although I have worked on contracts with them for more than 3 years. I also feel that agency is trying to squeeze more % out of this deal. (1) Do most companies refrain from directly contracting with one-person LLCs of former employees/contractors despite having a good relationship with them? (2) Is there a legal aspect on this where I should not seek to contract directly with the client and if I do, the agency might sue me? (3) My rate requirements are at a high-end of their spectrum and most jobs they round up for me have low rates. What is the best way to seek out a recruiter specializing in higher-paying placements? 1) I don’t think “most companies” have rules preventing them contracting with you directly (as a 1099 independent contractor) even though you formerly worked for them through an agency. 2) Any language that might possibly restrict your ability to do what you are proposing would have been in the agreements that both you and the client signed with that agency. Any “non-compete” clauses would probably be spelled out in those documents. 3) The “bill rate” that an agency charges to a client is MUCH higher than the pay rate they give to you. That “mark-up” is how they make their money! If you contract directly with a client, the rate you charge them will likely be lower than the agency’s rate … but still puts more in your pocket. Eliminating the middle man saves the client money, while at the same time pays you more. I’m not sure where you would fine a recruiter “specializing in higher-paying placements.” Every recruiter tries to get the highest rate they can based on how much in-demand your particular skills are. Again, it’s their mark-up that causes your pay rate to be so much lower than you could probably get by going direct. Adding some additional info: In 2009 there was a tax law change that requires all businesses to file a 1099-MISC form for each vendor they pay more than $600 in a year to. Prior to this change, companies did not have to file anything and the aggregate amounts were reported on their other tax filings. This in effect has created an additional negative incentive for large companies to hire small one-person LLCs as vendors, as they now are mandated to file annual tax forms for this vendor. If they have 1000 people each with their own company, the paperwork adds up. This is in addition to maintaining and tracking all of the different vendors and POs for their finance department that they already would have to do, but raises the stakes because it increases the audit surface area of the business. So there’s been a sharp decrease in the number of larger businesses that are OK to hire small one-person companies as vendors. They typically prefer to have one or two larger agencies that they work with instead, and require all contractors to work through these agencies. That’s great news for large consulting firms, but makes it very difficult for smaller or new firms. Good stuff, Nick. Since I recruit for one of those “large consulting firms” you mentioned, I’ll take your comment here as good news for me! I am currently having a permanent job, but the job role do not suits me. Today, I got an offer for a contract job in a big company, but through third party payroll. The salary they offering me is nearly same as what I am getting now. Should I Change? I don’t have enough information to advise you. I will say that most people would not quit a permanent job to go to a temporary contract – unless the circumstances are pretty drastic at your current company. Hi Michael, thanks for your response. Actually I am quite happy with my present permanent job with no work pressure. But there is nothing to learn here and today I got this offer of joining a temporary contract job. The pay scale is nearly same. I am only looking to join this new one for more knowledge at the cost of peace of mind and long hours of travel. Is this decision of trying to gain more knowledge at the above costs worth enough? I am a fresher with just 1.5 years of experience in my field(IT). It’s difficult for me to put myself in your shoes and weigh the pros and cons of each choice for you. Again — leaving a permanent job for a temporary contract is unusual and risky. You could end up unemployed when that contract ends. If YOU think it’s worth that risk to gain knowledge and experience that your current job will not give you, then perhaps it is worth that risk. Not everyone would make that choice or take that risk. The long hours of travel is another, separate issue. That, alone, would be enough of a reason for many people to quit a job. I was laid off earlier this year in February while I was approximately 5.5 months pregnant. I as on CA unemployment for about a month and a half before I went on disability and FMLA. I went back on unemployment in August and have been aggressively looking for a permanent job and been actively interviewing but nothing yet. I get calls multiple calls a day from out of state recruiters for contract positions and have blown most of them off for fear that they were not legitimate. A few weeks ago I happened to actually pick up the phone when one of these out of state recruiters called me about a position at a very high profile company and I chatted with him for a bit and gave him permission to submit my resume for this position. A few weeks went by and I got a call that this company wanted to do a phone interview. I did the first phone interview on a Wednesday and the 2nd one on a Friday and was offered the job the following Tuesday without even having an in person interview. Here is where things get interesting. When this recruiter called me he literally was pressuring me to make the decision on the spot and kept telling me how if I accepted this job I would be able to put this company’s name on my resume and Linked In and pretty much get a job anywhere after this contract. He said he was handing me the keys to the “Ferrari”. I told him I needed more time to think about it and he gave me about 2 hours to decide. I asked about the expectations of work hours and the commute because I am a mother of 2 and one is an infant and I am unable to work extensive hours and was concerned about commute because I was also going to be earning a lot less and I would be incurring costs of bridge toll and gas. He told me that there are shuttle buses that pick up from near my home that would take me to the building I would be working in but that he could get me the shuttle schedule at a later time. I accepted the position but something in my gut kept telling me something was off. The next day I had to hurry and complete tons of paperwork and get it over to them because I had to start right away on Monday, 10/6 which was a lot sooner than I expected and I was told if I did to start that day they would give the position to someone else. Well I reported to the orientation for contractors/temps/vendors and while onsite that first day I learned a few things that contradicted what I had been told. I learned that I could not put this company’s name on my resume/LinkedIn, that I was going to have to use a MacBook computer which was never disclosed to me or on the job description and my resume said I was PC compatible, I learned that there was NOT a shuttle that would drop me at the building I would be working in which meant I would now have to incur additional expense of driving in and the long commute and that the expectation of work hours was pretty much a whole lot of evening work and weekends which I specifically said I could not do since I have 2 kids I need to pick up and care for in the evenings and my spouse works nights and I don’t have anyone else to watch my kids. The next morning I contacted this recruiter and explained that he was not transparent with all of these details and mislead me and rushed me into this decision. He asked me if I was resigning and I told him I needed to understand what my options were because I did not want to jeopardize my existing UI claim. He told me to please go In and turn in my laptop and badge and that he would contact the client and explain it wasn’t going to work out because of the logistics of the commute, hours and that I was not a Mac user. I think he wanted to make sure he didn’t lose this high profile client and risk me telling them he totally mislead me but I agreed because I want him to cooperate with me should unemployment contact him. We agreed the position was “not a suitable match”. My question is, on my next unemployment claim form I know I need to report that I worked that one day and for the reason I was going to put down “position not a suitable match”. Am I at risk of losing my existing unemployment claim now because of this one day and because this recruiter failed to properly disclose the correct bus routes, work hours and computer compatability? I think he just wanted his commission. I am terrified to even consider contract work now because of this experience and am still aggressively looking for permanent work daily. I would tend to believe the client, since they are the ones who hired your consulting firm. They should know how long they’ll need you. This really is a good article. Helped clear up a lot of questions. I currently work “full-time” with a consulting company that in turn contracts to clients. The benefits are good, but the pay, not so much. They have a clause based on which the client cannot hire their contractor as a permanent employee. I have been here for over 3 years now. In the future, this client may not need me, but since I am a permanent employee within the consulting company, they will pay me my regular salary (for upto 2 months) while they look for another client that needs someone like me. In general, I was happy with what I was doing, the client was extremely happy and life was going on until this recruiter called me and told me about an opportunity that matched my skilled and qualifications almost exactly. I went ahead and attended interviews and I was notified that they really liked me and wanted to move forward. The technical recruiter told me this is a contract to hire position. I have to work 6 months to decide if they will hire me, and if they do decide they will, it will have to wait another 6 months. I *can* opt to get benefits through this staffing agency, but I don’t really need benefits as I use my partner’s benefits as a dependent and that is sufficient for us. Based on the hourly rate, and considering the sick leaves and vacation time, I will still be earning 30K more per year if I accept this position. My only question is about the contract to hire part. To me, it looks like #3 from your article. When I went into the interview, the manager did mention that some of the contractors have been contractors for 2 years now. Does it make sense for me to make this switch? DT: It does, indeed, sound like #3 in my article. Since you don’t need benefits, your choice is more about money than anything else. From what you described, it seems to boil down to a choice of staying in a “full-time” job with some sense of security but less money than you’d like … or moving to a “contract with the possibility to hire” situation for a lot more money, but less of a sense of security. Only you can determine how much that “sense of security” is worth to you. Good luck with your choice! I wanted to write in and thank you again for the post. What happened after this was that I did end up taking the contract with the possibility of hire job, and they have now extended a full time offer within the same company. I hope this post serves helpful for anyone who is considering a move like mine! I work on/off for a company as a contracted employee. I am not working for them again for 4 months. They pay me very well and actually gave me a nice bonus after my last assignment. Do you think the company would frown down upon me for collecting unemployment? I am nervous to risk losing any work with them because of this. My opinion is that it is perfectly reasonable for you to collect unemployment benefits for the 4 months that you are without work. It’s your right to received that money, and in most cases it should not cost your former employer anything. (They’ve already paid for it with taxes collected during your employment — you are just getting back what’s been paid in to that fund.) Of course, most companies want to limit the number of their former employees that file for unemployment because their tax rates might go up with more filings. But either way, it certainly should not jeopardize your chances of being hired back in the future. Hi I’m wondering is it frowned upon to be hired by a recruitment agency n then apply for a full time position directly to the company that the recruitment agency supplies workers to. So basically would the recruitment agency get dirty on someone for applying direct, after all it would be taking money from them really??? It may or may not be “frowned upon” by your agency, but they will almost certainly want to get paid by their client company for their hiring you directly. Most contract/consulting agencies have language built into their agreements with their client companies providing for a “conversion fee” to be paid by those companies if they offer full-time employment to one of their hourly consultants. Such fees may or may not be contingent on how long you’ve been contracting there. You yourself also may have signed paperwork with that staffing agency preventing you from accepting such an offer without the permission of the agency who originally placed you there. You should review any and all such documents with an attorney for better advice on how to proceed before discussing or accepting any offers. Ignoring such agreements could lead to legal action against you, the client company or both. I have a question on 1099 contract. Currently i am working on 1099 contract with my employer. Can I leave this job without giving any notice to my employer ? By doing so, will it create any legal obligations ? I am not a lawyer, so I cannot give legal advice. In addition, I don’t think there is a general, one-size-fits-all answer to your question. Every contract is different. You would need to look at the specific language in whatever documents you and your client signed in order to understand what your requirements might be for terminating your contract and/or giving notice. This information has been so helpful! I have a question: How does a contracting position end? I’m working my first contracting position, and it was supposed to be 6 months long. That was 2 years ago. My work has really run out and I flat out told my boss that I only have like 30 minutes of work a day now, and he told me he’s going to pretend I look busy because he is not laying anyone off – but if I want to leave on my own, I can. My boss has also hinted at how he’s thinking of assigning me tasks that I am not trained/able to do, and that are WAY ABOVE what was agreed to when I took this position. Is this the way contracting typically works? I feel like they’re just trying to make me bored/miserable until I quit, so that they won’t have to pay unemployment. Is that the standard for contracting? Thanks for any info/advice you can give! So glad to hear that my blog has been helpful! Your situation is not at all typical of contract jobs. First of all, you didn’t specify if you working through a staffing company, or contracting directly with the place you are performing your work. Either way, most employers would not want to continue paying wages to a worker who does not have enough to do! (In the long run, that is much more costly than any unemployment benefits you might receive if you were laid off.) I can see why a staffing company would want to keep you on a contract job as long as possible … they want to keep getting paid for your work at their client’s site as long as they can! The actual client, however, should be trying to reduce their costs, and not increase or extend them. And assigning you tasks that you are not qualified to do also makes no sense. Trying to force you to quit by making you bored or miserable is simply not a logical tactic. And saying “he is not laying anyone off” sounds very noble — but it doesn’t really add up as a logical way of doing business if there is a lack of work for you to do. If I were you, I’d be looking for another job elsewhere … but just stay put and keep getting paid until you find something better. Hi Michael, I know the decision I have to make by tomorrow is subjective and up to me to place value on the right things, but here it goes. I am a bit stuck. After my last contract ended, I managed to find a full time arragement with a consulting company, at a very good annual salary. The initial assignment would be for 12-18months, and they would pay me for time between assignments. The work is in pmo, not an actual pm. Being an actual pm is my career aspiration. A few days ago, one of the client companies I was contracting for in the past expressed interest in bringing me in for a temporary pm job with intention to hire and high possibility. They don’t have the FTE approved, but according to leadership recognition, there is a need for this fte and confidence that it would get approved. I need to decide by tomorrow. I have to start the job I got on Tuesday, and I got this call Friday. Now it’s Sunday. Any thoughts to help me organize my decision? Salary requirements for the new job have not yet been confirmed by them. There are pros and cons to both situations you described. I cannot really advise you either way. Too many variables. I’d say just “go with your gut.” Good luck. I currently work under a staffing company for a health care company. When I first started, it was only for a 6 month contract (to cover for someone while on maternity leave). My manager at the health care company liked me so much she wanted to keep me around so she extended my contract and continues to extend my contract until a full time position opens up in her department. The staffing company is paying me a low amount based off of the hourly rate the health care company is paying them for me and they will not increase my pay. I was advised by a friend once my contract is up with the staffing company that I could find out if another staffing company will except the same pay rate by the health care company but pay me more out of the rate and transfer to that staffing company if they are willing to do that. Have you heard of people doing something like that? If so, how do I go about facilitating something like this? What you are suggesting is not very commonly done, and quite frankly is generally frowned upon by people in the staffing industry. First, you should carefully read any paperwork you signed when you started the current contract with your agency. Most agreements include restrictions on contractors going to work for one of their clients through a different agency. You could get yourself into legal trouble if you signed, and then violated such a “non-compete” clause. Beyond that, how would you then convince your client — the health care company — to switch doing business from one agency to another, just so you can get a higher hourly pay rate? That may not be so easy. What would be in it for them? Plus, they may have signed their own “non-compete” clause with that first agency that would prevent them from doing exactly what you are proposing. And none of this will cast you in a favorable light. If you have any hope of landing a full-time role at the health care company, I would advise against rocking the boat this way. Better to simply stay put and hope that a more reasonable salaried position opens up there for you. You should also make sure your agency won’t have a problem with you being offered a full-time job directly with that client. Very often, agencies require clients to pay them a “conversion fee” if a contractor gets hired directly. Better to find that out in advance so you don’t get caught off guard later. I have a quick question. If I take a position where it is six months on and six months off and it continues the cycle over and over again, can I collect unemployment benefits for the six months I am off every time? This post has been very helpful! I am currently a FTE government contractor working with the company for 9 months. When I was brought on I was told the contract would end in a year however, the contract company is currently in negations to extend the contract for another 3 years. I was also told the position could potentially be added as a Federal position. I just found out that my position was advertised as a FTE Federal position with a very short open period (5 days). I happened to find out about the position from another employee. My question to you is what is the proper etiquette to address my concerns. The short advertisement date leads me to believe the government had someone internal they wanted to for the position and my concern is the time frame my contract position will be phased out. I’m not sure if I can talk to the government employee about it or just discuss with my contract company. It sounds like what you are asking is can you convert from being a contractor to a Full Time Employee, and if so, how … right? The answer depends on what agreement you have in place with your contracting firm (check the paperwork you signed when you started that contract job), and what agreement that firm has in place with their client — the place you are working. Most staffing firms resist attempts by their clients to hire their contractors because they make more money in the long run on a contract. You may have signed something that restricts your ability to accept a job from that firm’s client while you are still working there as a contractor. If they do allow a contractor to get hired by a client, they often charge that client a “conversion fee” which would be spelled out in their agreement between the firm and the client. You can certainly talk with both the staffing firm you are working for as well as the hiring manager at the place you are actually working to make your intentions known and to explore your options. No harm in discussing it with both — as long as you are honest and open about what you are doing. Just be aware of the possible contractual restrictions that may be in place. I am part of a very small theater organization and we contract actors for very short term engagements; generally less than 10 hours in a one week period. We do not require memorization but we do provide materials & direction as well as dictate performance & rehearsal times. Do you have thoughts/insight into how arts organizations are handling what seems to be a limited duration contract, but that the IRS is likely to consider an employee? I really do not have expertise in the type of short-term theater contract work you’ve described. I’m guessing that you would either hire your actors as W-2 employees who get paid via a payroll (with standard deductions like tax, social security, etc.) or as independent 1099 contractors (straight hourly pay with no deductions.) Another factor may be how your business is organized (non-profit vs. for-profit.) I would suggest that you contact an attorney or a CPA who is familiar with employment law and tax liability for more official advice. Good luck! Your comments are very interesting … and quite frankly, entirely out of my area of expertise! I don’t know anything about the IRS rules regarding per diem amounts. Better to consult with a tax accountant on this one. Good luck! I don’t know about your accountant but mine only deals with my situation after the money has already been earned. What’s needed is to be able to get advice on what the highest tax-free percentage is that won’t get audited BEFORE WE TAKE the gig so we can know that we can make the rate of return that we anticipate, or in effect that we can afford to do the job at that rate because getting an audit isn’t just an inconvenience, it may mean we lose money overall if the income status gets “recharacterized” and our effective rate is decimated. It doesn’t surprise me that you don’t know the answer but on the basis that you’re giving people advice on how to figure out whether to take a particular assignment, it strikes me that it’s the kind of information that you ought to be prepared to give out to someone who wants to know, even if I do agree that this particular information doesn’t appear to be readily available to the public! When offered a “permanent” position vs. a “temporary” position; ALWAYS choose permanent. If you do not have a choice, and only temp work is available, take the temporary work. However, be careful. Because as a 25-year corporate veteran when I look to hire someone and I see they’ve “puddle jumped” or have worked several short-term positions, it is difficult to know that the reason was due to the economy. Or, they just get bored easily, were fired, can’t hold a job for more than a year, etc. So, if temp is all that is available, take it. A job is a job. However, it is always wise to go for the permanent position. One tactic I have taken personally is asking the gaining employer interested in me upfront if they are willing to change the 12-month contract position to permanent. If they are not willing to even discuss the matter, then they are a substandard employer and certainly not 21st century material. Move on. With that type of mindset, even if the position was permanent you would end up either being fired or quitting due to the fact this “mom and pop shop” employer mentality will certainly end your short time with them, and mostly likely they are struggling financially due to their myopic view with regard to hiring (their are more significant management problems behind the curtain). In other words, other than budgetary constraints, there is no good reason an employer would not want “permanent” highly motivated people who want to dedicate themselves to a company and are in it for the long-haul. In addition, at the executive level especially this applies due to the fact business strategies are written based on a 3-5 year plan. An executive given 12-months only will not have the opportunity to do nothing other than make minor changes and effect the day-to-day operations. I agree that “Permanent” positions are generally more desirable than “Temporary” contract jobs. The overwhelming majority of job seekers I encounter every day would agree with that, and would prefer to land somewhere full-time vs. accepting a contract job. However, you must realize that there are also many professional “consultants” out there who prefer the lifestyle of traveling and working on project-based temporary assignments with different clients. Some of those consultant types work in salaried positions with big firms (E&Y, Deloitte, IBM, Accenture, etc.) and others are independent consultants who are either self employed, or work though agencies (like mine!) on an hourly basis. Depending on how in-demand their particular skill sets are, many of them make WAY more money than so-called “permanent” employees in similar roles. I would never characterize such consultants as “substandard” or having a “mom and pop shop” mentality. It’s not fair to make such sweeping generalizations. Every person and every job scenario is different. OK Michael here’s one I would appreciate an answer on, when there’s a new contract in my area where they’re looking to hire tech people and there’s ANY “classified information” involved, the ONLY contracts I ever hear about always specify “must have existing secret clearance”. As far as I know there’s not supposed to be a way to “hold onto a clearance” between assignments, so I don’t know how you could be prepared for that unless they were “stealing” you from another classified assignment. Is there some way to hold on to a clearance that I don’t know about, say for active reserve military or something? There’s just something not quite fair about this whole thing! Sorry, Jeff … but his one is beyond my area of expertise! I’d advise you to check with whatever government agency or entity it is that issues the “secret clearance” status for the rules that govern such things. Good luck. What’s the minimum number of days (calendar days or business days) of separation from a client company between temporary assignments as a contractor (on W-2 or 1099) to that client company? Where can I find the law which dictates that? I do not understand your question at all. Minimum number of days of separation for WHAT? Unemployment benefits? Health insurance? COBRA? You need to re-phrase your question — as it is, I have no idea what you are asking. Whether you are W-2 or 1099, contract jobs are, by definition, temporary. They can last for 1 day, several days, weeks, months, or even years. At some point they almost all end — and most contractors have periods of no work between contracts. Most contractors only get paid when they are actually working, and don’t get paid at all when they are not working. SO … again, what are you asking? If my contractor job through a staffing company at its client company ended, for at least how many days do I have to wait until I am allowed to start working for that same client company again as a contractor? Where can I find the law, which dictates that? I assume you mean that you want to return to work at that same company … but without going through the agency, right? That sounds like contract law. In the U.S., the laws that govern such things may vary from state to state, depending on where you live and work. It all boils down to the contract you signed with that staffing company that originally placed you at that client company. Any restrictions are probably specified in those papers. You need to look for a “non-compete” clause preventing you from going to work for one of their clients (on your own) for some period of time after you leave — it could be anything from a few months to up to a year or more! For obvious reasons, they want to make sure you only work at that client company through their agency — they want to keep making money off of you! You should read the paperwork you signed, and consult with a lawyer to find out how binding and/or enforceable such restrictions actually are. That’s why I asked you the questions in my previous comments (#138 and #140), but I learned from another recruiter during a phone conversation today that the 90 day gap was required by Company X not by the law. Because of the poor voice transmission over the cell phone, I did not understand the reason that he explained to me, but after the phone conversation, I figured that he probably said that Company X made that rule to protect the exclusive right of the original staffing company to place a contractor back to Company X within 90 days from the end of the contractor’s previous assignment to Company X; after the 90 days, another staffing company is allowed to assign that contractor to Company X. Companies use foreign workers all the time — it is very common, especially in the IT area. To work in the U.S., foreign workers must obtain the proper type of Visa to be employed here. Usually that is an H-1B Visa, which is not easy to obtain (there are annual quotas on how many are issued), is rather expensive and requires a company to pay to “sponsor” the worker. That sponsor can either be a contracting agency, or an actual client company that directly hires the worker. I’ve been with my company for 10 years and they took 8 employees (me included) and said we are now technically employed through another company name but stay at same facility and are talking about making us contact workers what does that mean for us. I can’t get straight answers from employer and am clueless on how this works. All but two of them have been there longer than me is this an easy way to get us out the door? I work in the aviation field. From what you described, it sounds like that company you worked at for 10 years has converted you from a full-time salaried employee to an hourly contractor. So, now you are no longer on their payroll, but rather you are employed by an outside agency. Your paychecks will come from that agency now, even though you will continue to do your work at the original company. “What does that mean?” you ask … your guess is as good as mine! If they do want to get rid of you at some point, it will be a lot less complicated for the company to simply end your contract than it would be to terminate a permanent employee. However, that doesn’t necessarily mean that they plan to do that to you. I have no way of knowing their long term intentions. And, of course, you may or may not be eligible for the same level of benefits from that new agency you work for now compared to your prior situation as a permanent employee. Yes, working is better than not working … but sadly, contracting is generally not as secure as being a permanent employee. if someone has two job offers, one is 6 month Contract to hire and 2nd is full time. which should he choose, which job is more secure? I have no idea of the details … but in general, all things being equal (salary-wise), a full-time job is better than a contract-to-hire — especially if it includes benefits. First, thank you for going over these details, it was a great read. My question to you is the following: How do I list full-time positions and contract work on my resume? I worked alternatively contract and permanent jobs for the past 3 years (total of 6). My contract work were 6 months or less and my full-time positions did not last a year. I am currently looking for work and know that a traditional resume would not the best way to go about it. I have tried the combined resume format and combined all my contract work together with dates. Below that, I listed my permanent positions (2 total). Unfortunately, chronologically, it does not make sense because I worked permanent positions in between contract work. I am afraid that it might confuse a future employer. Do you have any advise on how I can make it work without raising doubts on an employer’s mind? I just want to ask if it is okay to put on my resume the experience I have in my previous work even I did not finish my 6 months contract?. I only 3 months experienced of working on the company. You can include anything you want on your resume, as long as it is truthful and shows experiences you’ve had that might make you valuable to a future employer. Just make sure you provide explanations for short stints (e.g. “project ended” or “position eliminated” etc.) If you left a 6-month contract after only 3 months, be ready to explain the reason to an interviewer who asks you about that. I am a retired public employee who receives a state pension. I’m allowed to work a maximum number of hours a year without impacting my pension. I’ve been offered and accepted an interim professional (i.e. exempt) government position that won’t affect my maximum allowable annual hours but will sometimes require more than 40 hours per week. The limited duration contract has not yet been sent to me but we’ve agreed on an hourly rate. My question is: Can I be paid hourly in an exempt position to accurately be paid for the hours worked or must I be paid a salary and possibly lose money during the term of the contract? I’m not sure I understand your question or your situation. You said you are being hired as an “exempt” employee — but with an hourly rate. That sounds like a contradiction. Here the definition of “exempt” positions: “Exempt positions are excluded from minimum wage, overtime regulations, and other rights and protections afforded nonexempt workers. Employers must pay a salary rather than an hourly wage for a position for it to be exempt. Typically, only executive, supervisory, professional or outside sales positions are exempt positions.” I do not know anything about how your state pension plan works, or how being salaried vs. hourly would impact those payments. I would advise you to seek the advice an attorney who specializes in employment law. I work as a parti-time legal assistant in a law firm. The regular assistant has been there for 20 years. I have worked for the firm for 4 years. Since we had a severe fall out it is my understanding she threatened the owner to leave unless I leave. He has hinted the situation to me expecting me to leave on my own. What are my changes of collecting unemployment benefits. I get a 1099 every year. Thank you. Thank you for your kind response. I am not interested in a lawsuit but I do want to see if I can benefits. I will go to the unemployment office in a few days. The lawyer is my friend for 30 years but I guess he is being held hostage by that woman. She is awful. I just think it is unfair but what can I say. Take care and thank you, again. I recently retired from a pharma company and it was not a salaried position, but union. Now the company wants to bring me back as a consultant to train new employee’s. My question is how much money should i ask for, how do i know what to charge for my service? I have no idea what trainers in the pharma industry charge for their services — it’s not my area of expertise. I would suggest you seek out others in your network who do that job, and simply ask them what the going rate is. The contract indicates that they must have to inform me 2 weeks in advance before last day of service, do I have to understand that they must tell me in advance? I cannot possibly comment on a contract document that I have not seen, which may or may not have already expired years ago, and which may or may not obligate the company you work for to give you advanced notice before terminating you. My best guess is that you no longer have any protection, and can be terminated without any notice. There must be someone who you work for that you can ask, no? Just asking out of curiosity for my friend. Lets say his name is Sam. Sam went to an interview approx. 6 months ago where they discussed a full time job as an exercise scientist making it seem as if clients would be given to him and there would be lots of work for him, keeping in mind he has an amazing work ethic and willing to work 60+ hrs a week to build a client base. He then found out 50% would be taken from what he earns (and although I feel it is unfair after 5 years of study to be paid $20 per client we both felt like that would be ok). He signed a contract as a consultant with the company (lets call it COMPANY) and after working their for 3 weeks and having to move out and not evening earning enough to cover his house rent (working 13hr days) and only just finding out about having to pay gym rent ($200) he would like to quit. It says in the contract the company can release him with immediate effect or he gives 90 days notice which he will do tomorrow. If he is to ask the owner of the gym he works at through the COMPANY to hire him again after he terminates his agreement with the COMPANY could he be breaking the law? He mentioned it in a very considerate way to the CEO but he started to become abusive, name calling and saying that he could go to jail for going behind his back even though my friend Sam was asking because he didn’t want to go behind his back and didn’t think this would be an issue at all. Your main question (“could he be breaking the law?”) seems to be a legal matter, so I cannot answer that. I would advise you to show the contract you signed to a lawyer for a more informed opinion. I’ve learned some very helpful things on this page – thank you!! Here’s my current situation – I worked as a perm FT employee for a company for 6 years, was rebadged to a perm FT for another company via a partnership for 3 years. I left for a perm FT position for a lot more money (finally over 6 figures). After just one year, I was recruited to another perm FT position and after 16 months I was laid off a few weeks ago. I now am being recruited by a staffing agency for a W-2 FT contract-to-hire position for a company in the same industry. It is a 3 month contract. Staffing agency could include health benefits if I wanted (at a lower pay rate). The pay being offered is the same as my last position, but the title is one step down, so seems reasonable. The last 3 companies I was at were exhausting. I’m burnt out. I’ve been looking for a company with at least 3 stars on glassdoor. The contract-to-hire company has exactly 3 stars, however when I filter the search for the title I’m being offered, it goes down to 1.5 stars. I’ve been there and done that, it is not fun working so many hours that I was getting sick over the weekends every few weeks. Also, the contract-to-hire company is not a company I would normally be interested in (although it is in my industry) – it is in a portion of my industry that I don’t really like. I wouldn’t choose this job if I had another choice, although the position (job description) itself looks like a good fit. Also, it looks like the 3 month contract will end around the holidays, very tough time to get hired elsewhere. If I take it, I will have essentially no gap on my resume – a good thing. If I can’t get another FT perm position elsewhere by the time the contract ends (and I don’t get hired FT), I could look worse than I do now as I will 3 relatively short-term employments. I’ve just started to search aggressively and feel there has got to be something better out there, yet I have friends that after being laid off were unemployed for months. It appears to get harder and harder to get employed the longer you are unemployed. It is true that the longer someone is unemployed, the less attractive they may look to a potential employer. That’s just human nature. 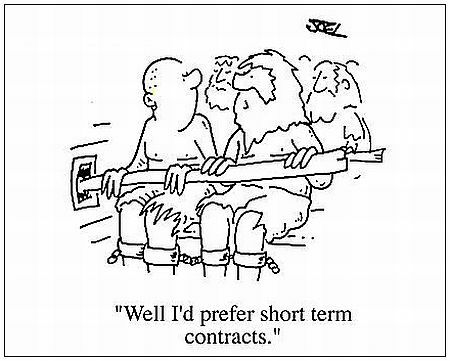 You should keep in mind, though, that a 3-month contract might seem a “short stint” on your resume — but I would advise you to clearly label it as a “short-term contract position.” Then when it ends, indicate that it ended because the contract was successfully completed. That explanation avoids the appearance of the short stint being caused in some way by your own job performance. On the other hand, accepting any job that you know going in will be an unpleasant, stressful situation is not a choice that makes sense to most people — unless you simply need the income and cannot find anything else in the immediate time-frame. I hope that is helpful advice. Thank you for all of the wonderful information on this page. As a person just entering the job market after university and looking into contract employment for the first time, the advice you have provided has helped immensely! I have a general question about tactics used by recruiters in hiring contract employees for a client company. I have been in contact with multiple recruiters from one consulting agency during the course of my job search. I have noticed that in many of these interactions with recruiters, I often have to ask for information multiple times before it is provided to me and the recruiters often act as though it is my fault that the hiring process is not moving along faster. Recently I had to wait a week before a recruiter responded to my multiple requests for a formal offer letter after I was verbally informed of the job offer, only to have the recruiter state that I had to return the signed offer letter by the end of the day to still be considered for the position. All of this occurred despite the fact that I had asked for a couple of days to look over the offer letter in my original requests. I have experienced this same lack of communication and (what I would consider) heavy-handed tactics on many occasions in dealing with this consulting agency. Dealing with the recruiters at this agency has become more and more of a pain, to the point where I am not sure that I want to take the current contract offer because I would have to continue working with this agency. Are these types of tactics common when seeking contract jobs through a consulting agency? What should I be looking for in a 3rd party agency to avoid these types of headaches in the future? No — the behavior you described is not “common” among recruiters or staffing agencies in general, and should NOT be considered acceptable. I have certainly heard similar stories before, and I do know of specific agencies who have bad reputations and whose recruiters behave this way all the time. As with any profession, there are good recruiters and bad recruiters. Yes, there are recruiters out there who lie, cheat, deceive, bait & switch, promise things they cannot deliver, and will pretty much do or say anything to get a placement and get paid — similar to the stereotype of Used Car Salesmen. I’ve met some of those people, and their sleaze factor can be quite astounding! Unfortunately, similar to the image problem that lawyers have, those bad recruiters tend to give the entire profession a negative reputation. How can you tell the difference between good and bad recruiters? Just like with any other business relationship, time will reveal the traits of a person worth working with: honesty, integrity, sincerely, responsiveness, timely follow-through, etc. Good recruiters treat everyone with respect, and care about the people they work with. They try to do the right thing, and look out for everyone’s best interest – their own, their client’s and their candidate’s. Good recruiters will follow through with things they say they will do, and will be good about keeping you informed with updates and progress reports. Expect good communication … and beware of anyone who suddenly stops returning your calls or emails — that’s a telltale sign of unprofessionalism that is certainly not limited to recruiters! When asked to clarify the clause in relation to accommodation, it was stated that if accommodation the company has set up is not desired and my own is used, they will provide the money for two months of its cost, not beyond that. However, when I arrived, I was housed in an apartment belonging to the secretary of the board. But, during my third week of stay, he stated he has other clients to come in to rent the place and I needed to find an apartment of my own. I began hunting for apartments under the impression that when I do find one, the cost of the one month and one week that I would not have spent in the accommodation given by the board secretary would be paid. Now, when I am asking about the payment of those funds, I am told the board will not pay the cost, as “two months accommodation” only means a place to stay for that duration of time. What can I do in this regard, as I made my financial decisions on the premise that I would be receiving at least one month accommodation payment remaining from the two month clause stated. Further, in the past when new employees were hired earlier in 2016, they were given payment for accommodation based on the same contract. Yours is a legal/contract-law question. I am not a lawyer, so I cannot really offer any useful advice on how to proceed. You should consult an attorney. I only hope you got that promise for the lodging allowance in writing! I really enjoyed your article. I was doing some brief contract work with a consulting firm as a senior business analysis while waiting for a security clearance with the U.S. government. The clearance was a 7-month long period but then they went into a “hiring freeze”. So I’m on a waiting list. For my present job I indicate the few assignments I did as an analyst. But the job didn’t last long because the company did not reimburse fully for travel and it was a commission-based position. It looks great in the write-up but I’m worried I might be questioned about it to discuss at length. If discovered that this position didn’t last long and I have a year out of work (I also did a few other positions in sales), is there a better way to write this time frame? I’m willing to pay a professional writer to help with this paragraph. The rest of the resume reads very well in my opinion. But as the “first up” view of the resume, I would like it to look professional and concise, not doctored up (if you know what I mean). Many thanks for your help! My only advice on short stints on your resume is that the dates listed next to each job do not have to include the months – instead, you can show them as a range of years. I suggest you read “Explaining Short Job Stints and Employment Gaps” for a more detailed explanation of what I mean by that. Hi – thanks for all the terrific information in your blog. I am a west coast-based lawyer and have been on a long-term assignment (over 2 yrs now) doing litigation support type work through an agency that shall remain nameless. The project has been extended (yet again) and will continue for the foreseeable future. I and some of other temps I work with have been debating whether we should ask for a raise at this point (having been locked in at the same rate from the beginning). In the past we shied away from doing this as it appeared the project’s end was imminent at various points (but in reality, it kept on rolling). One of the particular things we occasionally ponder is whether agency contracts with clients typically contain in their boilerplate a provision automatically increasing the hourly rate for the temp that is charged to the client after a certain period of time (say, a year or 1.5 years or whatever). It would be rather galling if that were the case and that no piece of such increases were making their way down to the actual temps doing the work. If such provisions are customary in the industry, it would make asking for an increase that much easier. In addition, is there any strategy you would suggest for how to go about doing requesting an increase in the context of a temp gig (albeit, a very long one). We are regularly in touch with personnel from the client (who have routinely expressed appreciation for our good work) and wondered if it would be useful to feel them out about it and whether they would be supportive of our requesting an increase from the agency and how an agency might react to that. Thanks in advance for any advice you can offer! Yours is a good question. Asking for a raise is absolutely something that you should bring up with the person from the agency that you work through. After 2 years of successful contracting, you have every right to expect a pay increase. I have never heard of a “boilerplate provision automatically increasing the hourly rate for the temp that is charged to the client after a certain period of time.” The bill rate your agency charges the client for your hours was set when the project started. They may or may not have increased that bill rate with the client since your project began — but that’s not typically something that is predetermined. If you ask for a pay raise now, they will most likely approach the client and also ask to increase the bill rate to keep their mark-up margin the same. I would NOT advise you to talk with the client about a pay increase or “feel them out” about such things. Knowing they appreciate and value your work is a good thing, and you should certainly bring that up to your agency when you ask for the raise. However, you need to remember that you are employed by the agency, not the client. Let the agency negotiate bill rates with their client. Going around them and talking directly to the client about such things is a big no-no. Thank you for sharing such good information.My question is more towards hiring process of a Consulting firm. I went through an interview process with a consulting firm and they offered me a verbal offer for the job. But in two days they mentioned that they cannot bring me in yet and possible of delaying the offer letter as they are looking to place the position with a Client who has delayed the project. They cannot bring me in and bench me right away. What does this mean will i ever get the job offer ? How does a position open up in a consulting firm and get filled. What do you think happened here ? Thank you Michael appreciate your quick feedback ! They might not work because of an injury, a current “lack of need” of the employee’s skills, or even if the company no longer needs the employee, or goes bankrupt. They are still guaranteed their full (in this case 3 years) of income. This type of contact must have a business “name” that – while rare in the real world – is still referred to and/or negotiated. Interesting comment/question! Those sports contracts we all read about really have no relation to the type of “contract jobs” that this blog article is about. As you pointed out, those multi-million dollar sports contracts really are rare in the real world. I don’t know of any official “name” for them, other than simply “sports contracts.” You could say the same thing about recording contracts for musical artists … although in their case, it’s more common to hear about artists NOT getting paid after putting out recorded works — and then having to sue their record companies to collect what they think they were owed in the first place. Crazy worlds of sports and entertainment contracts — not just rare, but somewhat insane if you ask me! I have a question in regards to writing a resume for an individual that has been consulting on and off for the financial industry. 20+ years of experience. Since 2012 he has been in the consulting industry. Prior to 2012 he was employed at a firm full time for 9 years. How do I write the resume. for the consulting positions from 2012 to present? The resume is coming three pages. The best way to condense a long period of consulting is to list it as one long job heading — say from “2012 to Present.” Then you can describe some of more significant client companies where contract work was done as separate bullets under that umbrella of the “Consulting” heading. You do not have to list dates for those individual contract jobs, nor do you have to list each and every contract job done during that long period of time. Just choose highlights where the description of what was done adds value to the resume. Hope that is helpful. I was just extended an offer through a recruiter by a company who wants to contract me. When I was contacted by the recruiter he sent me the job description and that there was a 12 months contract offered. Now that I received the official offer from them it does not state this. The at will termination I get, but shouldn’t a contract state at least how many months it is for? What is the norm in this case. Whether or not your staffing firm lists the expected length of your contract job in their paperwork, in most cases it’s not really up to them when a contract is terminated. Contract jobs can be ended early by the client, and they can also be extended by the client. No reason needs to be given. Whatever period of time you were told (e.g. 12 months) is what the client told the staffing firm they expect, but it’s not a guarantee. If you feel more comfortable having that expectation in writing, you should ask your recruiter if it can be written into your paperwork. However, just realize that such things are not binding in any way. A “12-month contract” can be ended at any time, and there’s nothing anyone can do about it if that happens. That’s just the nature of contract jobs. A contract ended for me earlier than the verbal understanding. A 6-month contract ran out of work for me to do. So they called me in and sent home at lunchtime, paid me for the whole day as if they were doing me a favor. I scrambled but it still took a month for recruiters to get me interviews for another contract. Got unemployment since I worked at another company beforehand that had paid into that benefit. On the other hand, I also left a 12-month contract early (with notice) after just 9-months. I felt justified since it was a union company that expected employees (and contractors) to take 2 weeks off every quarter during strike negotiations. For me it would have been without pay, so I let them know that wouldn’t work for me. My recruiter couldn’t get them to make an exception for contractors. After those incidents, I went back to working for a corp – mostly due to high cost of Obamacare.